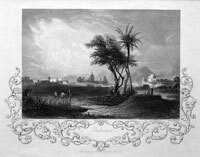 A steel engraved view by T. Heawood from the picture by E. T. Compton. Published by Cassell and Company. 9 1/4 x 6 inches. Uncoloured. Good condition. THE PORT OF LEGHORN. A hand coloured steel engraved view. Engraved by J. C. Bentley after a paining by Sir A. W. Callcott, RA. 9 3/4 x 6 1/4 inches. In a sunk mount. Good condition. 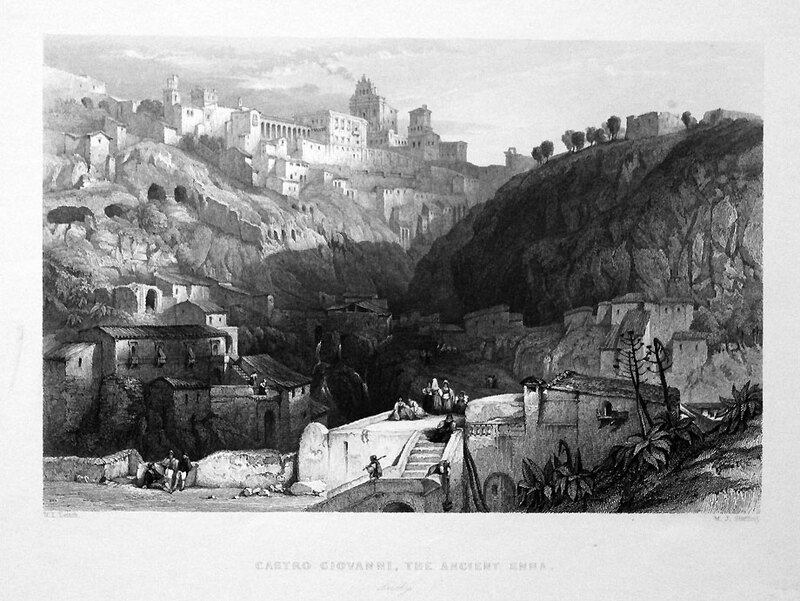 SCENE IN BENEVENTO, CALABRIA. 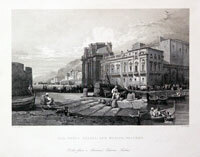 Engraved by J. Godden from a work by C. Bentley. 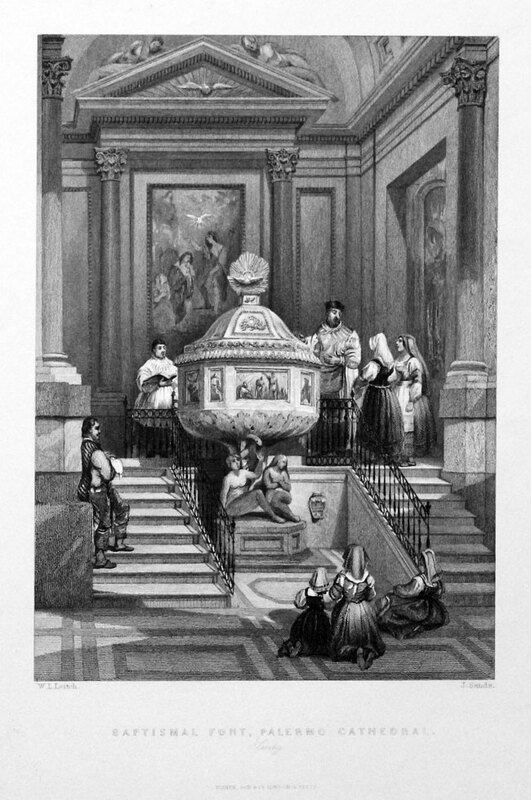 A steel engraved view with figures. 7 1/2 x 4 3/4 inches. Uncoloured. In a green sunk mount. Good condition. ROCK AND PROMONTORY OF SCYLLA, CALABRIA, ITALY. Engraved by W. J. Cooke from a work by T. B. Aylmer. Uncoloured steel engraved view with figures. 7 1/2 x 5 inches. Good condition. VILLA DORIA, GENOA. An uncoloured steel engraved view. 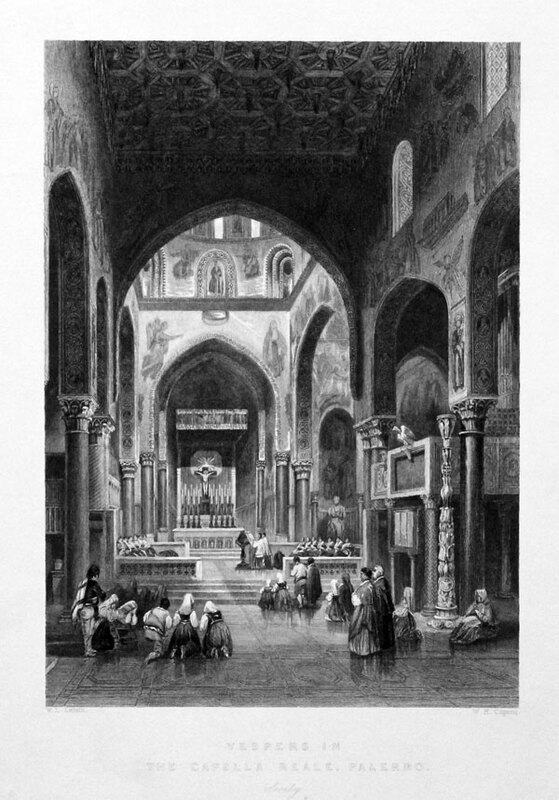 Engraved by A. H. Payne from a work by H. Bibby. 6 1/4 x 4 inches. In an attractive grey mottled sunk mount. Good conditon. 65228 The Town and Castle of Ilri. 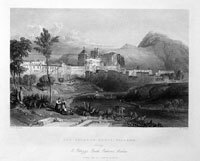 THE TOWN AND CASTLE OF ILRI. 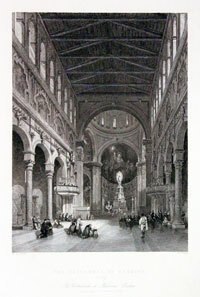 An uncoloured steel engraved view with figures in the foreground. 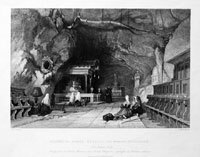 Drawn by Major Irton and engraved by T. A. Prior. 7 1/2 x 5 inches. Good condition. In a sunk mount. 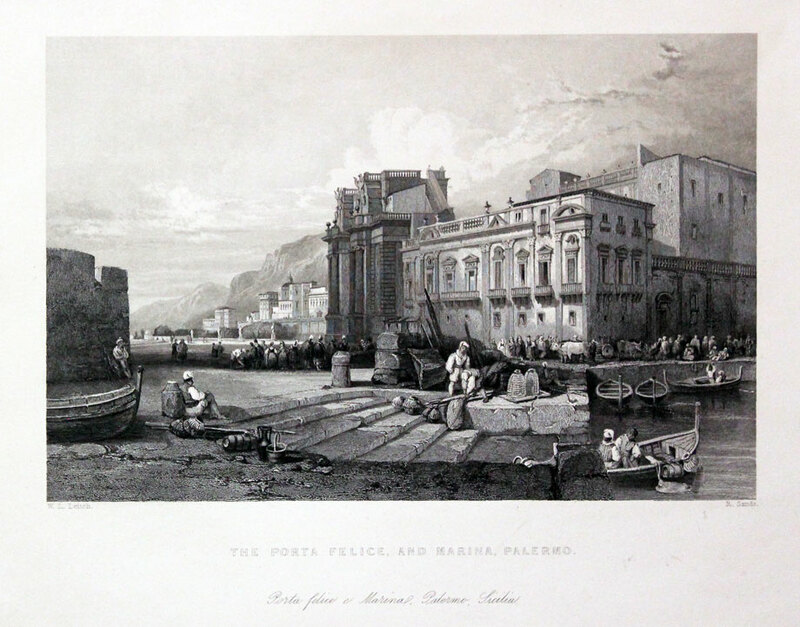 88514 The Porta Felice and Marina, Palermo. 95353 The Palazzo Reale, Palermo. Uncoloured and mounted. Small spot in sky. 95351 The Porta Felice and Marina, Palermo. 95352 The Porta Felice and Marina, Palermo. 95350 The Porta Felice and Marina, Palermo. 88511 Shrine of Santa Rosalia, on Monte Pelegrino, near Palermo, Sicily. Uncoloured - loose. 88517 Castro Giovanni, the Ancient Enna, Siciiy. Uncoloured - loose. 39870 Vestibule of a Moorish Villa, Palermo. 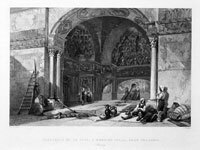 44837 The Palazzo Reale, Palermo. 88505 Vespers in The Capella Reale, Palermo. 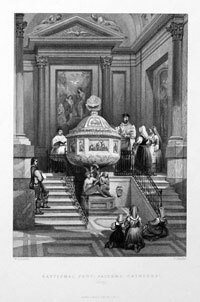 88506 Baptismal Font, Palermo Cathdral, Sicily. PALERMO. A steel engraved view by J. Muller engraved by A. H. Payne. 6 1/2 x 4 1/2 inches. In a sunk mount. Good condition. 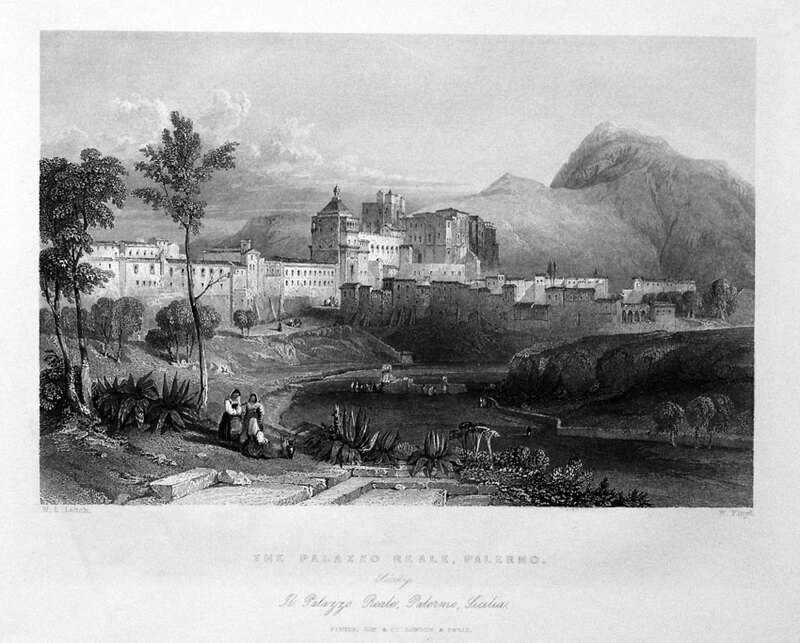 PALERMO. 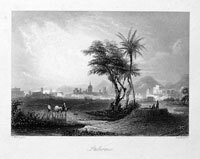 A steel engraved view by J. Muller engraved by A. H. Payne. 6 1/2 x 4 1/2 inches. The title set within a decorative border. In a sunk mount. Good condition. 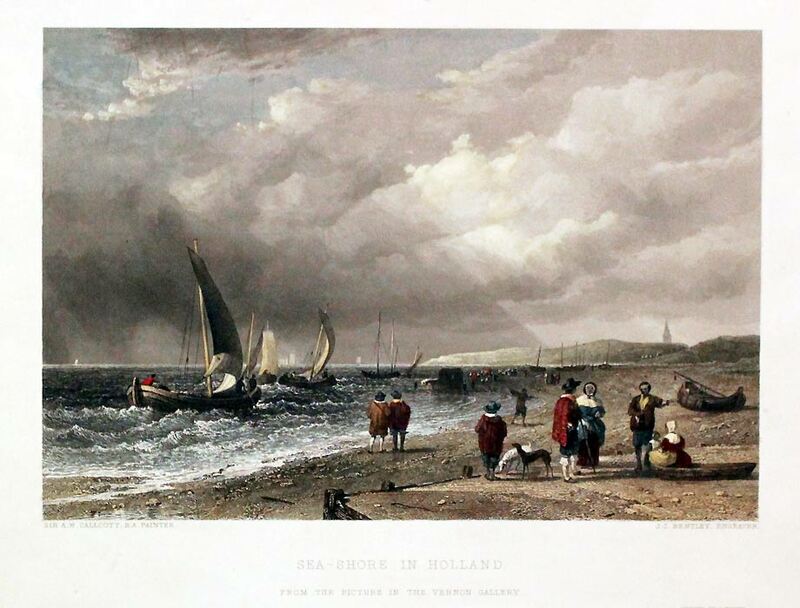 SEA-SHORE IN HOLLAND (From the Picture in the Vernon Gallery). Sir A. W. Callcott, R.A. / J. C. Bentley, Engraver. A good steel engraved view with figures. 9 1/2 x 6 1/2 inches. Hand coloured. Good condition.